Writer, actor and eternal princess Carrie Fisher was born on this day in 1956. Her literary breakthrough came in 1987, with Postcards from the Edge, a semi-autobiographical novel. She also wrote the screenplay for the 1990 film, which starred Meryl Streep as a drug-addicted actress, and Shirley MacLaine as her mother, a former musical comedy darling. A new memoir, Shockaholic (Simon & Schuster), debuts in November. We have yet to read it, but the reviews thus far are not stellar. 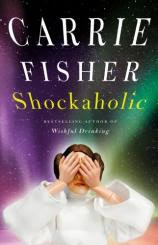 “Not exactly electrifying reading,” complains Kirkus, going for the easy shot (one of the things Fisher talks about in the book is electric shock therapy). We’ll hold judgment, but make a request of the author: isn’t it please time for another novel?